Today I’m going to give you tips on affiliate marketing for beginners. I want to talk about what's worked for me while becoming successful with the Clickfunnels Affiliate Program. The Clickfunnels Affiliate Program is a wonderful online affiliate marketing opportunity. If you've never done affiliate marketing before, you should really entertain that as a possibility because it's a fantastic passive income stream that my family and I enjoy. I’m even one of Clickfunnels dream car winners! For me, affiliate marketing has been as easy as talking about something I'm passionate about and use everyday. Luckily, it’s not that hard to start. You can set yourself up as an affiliate, place links on your website, and jump on the path to earning commissions, all within a couple of hours. So I'm going to talk about the Clickfunnels Affiliate Program and I'll also be talking about Sales Funnel Blueprint-- a new tool with you encompassing all my insights and tactics to my online business success. The Clickfunnels Affiliate Program has a 100 day challenge to give away 1 free trial of Clickfunnels a day. Founder, Russell Brunson says that once you’re in the groove, this you should only take you one hour or less each day. Once a person becomes a member of Clickfunnels using your affiliate link, you get paid 40% commission off of every person you refer. There are two levels of Clickfunnels membership. A $97/month level and a $297/month level. So if a person buys the first level, you will be making about $40 a month from just that customer. Ultimately, the goal is to refer 100 people within the 100 day challenge so that you could be making $4,000 a month! If you do the math, that’s $48,000 a year. In my own experience, I actually hit $48k between 75 to 100 customers because of the supplementary commission you get from the products your customers buy. That’s a lot of money for not having to do customer support or software development. Ultimately, your only job is to promote Clickfunnels and get people to click your affiliate link before they click on someone else’s. According to Funnels Ignition, there are three main reasons why people are so successful with promoting Clickfunnels. Which simply means that when you send Clickfunnels a lead from any product or bonus and they sign up using your link, they are your customer until the end of time. They don’t have to initially buy anything to become your customer, but once they do, you will get commissions on whatever they buy forever and always. There’s nothing quite like Clickfunnels. It’s one of the top programs in the online marketing world, and it’s continuing to evolve! They are so far ahead in the race and no one can catch up with them. You will not find a similar product anywhere that offers such power, so make the most of this opportunity. The more people you have signed up through you, the more customers you have. The more customers you have, the more commission you’re making both from subscriptions and also products they buy! As you build your audience, your customer base, you will very tangibly see more cash flow. One of the reasons I've been so successful with the Clickfunnels Affiliate Program is that it operates from subscription based revenue. This is key as you research affiliate programs. Why? You’ll have a more predictable income. As people sign up under your affiliate link to pay their monthly fee for the service or product you promote, you’ll be able to project your revenue for next month as you gain more subscribers instead of one off customers. With that said, businesses that monetize from subscriptions have a higher retention rate than those that don’ t. Think about it—the hardest part of business is making a sale. With a subscription, you’ve already done the hard work of convincing your customer of how amazing your product is to the point that they’ll come back on a predictable monthly basis. Sales Funnel Blueprint can teach you more about how to obtain customers on a subscription basis. Once someone is locked into a subscription, all you have to do is make sure they stay happy and active with the product or service you choose to promote. The Control Blog points out that a business can grow and expand much faster with subscriptions because they’re not spending energy on retaining customers. Another reason I've been so successful with the Clickfunnels Affiliate Program is because I'm really really passionate about it. 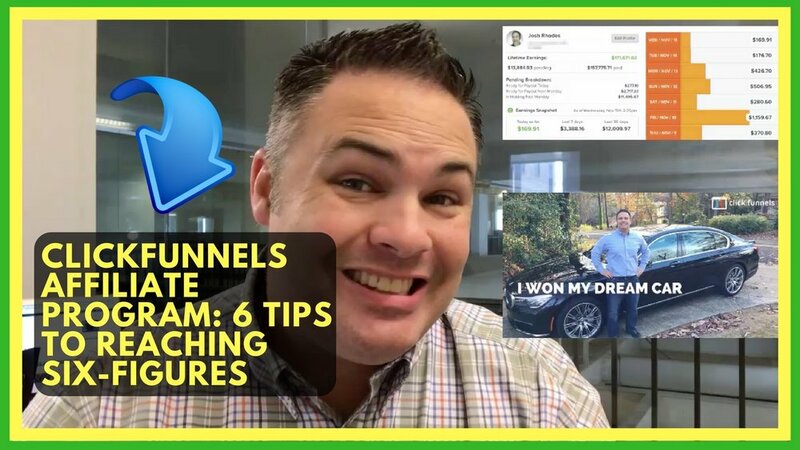 Clickfunnels has helped me build both of my six figure businesses, which is why I love promoting it and teaching people about it. To even obtain recurring revenue with an affiliate site, you're going to need to be able to attract an audience, and in the affiliate marketing world, there's nothing more attractive and trustworthy than your passionate copy (which Sales Funnel Blueprint can help you write) and personal testimonial. So why not promote something you already use and love, and something you know really well? You’ll have way more credibility if you funnel your leads towards a product that you use everyday for your business. Your followers will trust you and will be more likely to purchase your affiliate product. With all of that said, if you're considering joining the Clickfunnels Affiliate Program, or any affiliate program, Sales Funnel Blueprint is your next step. This product is only $29.99 and gives you access to the same marketing strategy I used to create over $217,065 in affiliate commissions without using expensive paid traffic strategies. It's all broken down into modules like How to be Successful Online, Copywriting, and Building Sales Funnels. All of the lessons are things I had to learn through trial and error and in selling it to you, I'm giving you the opportunity to learn it on the front end to catalyze your online business success. This is a great opportunity if you're wanting to build multiple streams of income. With one income, you cannot build wealth. You need multiple streams of revenue to GET AHEAD and "snowball" your disposable income. You ned simple tiny business models. The process doesn't have to be overwhelming. The key is to start with tiny revenue streams that grow into tidal waves of cash. BASICALLY, I'M SHOWING YOU EVERYTHING: After this masterclass, you'll be able to launch a new business of your choosing without the mystery or brain fog that would otherwise keep you from acting quickly and efficiently. And all of this can be yours for just $29.99! If you want to go deep and get a great framework and structure of funnels that are done for you. If you want to access the skill set that I've used to build my affiliate businesses, then buy Sales Funnel Blueprint! The Clickfunnels Affiliate Program is a wonderful online affiliate marketing opportunity. If you've never done affiliate marketing before, you should really entertain that as a possibility because it's a fantastic passive income stream that I enjoy for me and my family. I’m even one of Clickfunnels dream car winners! The Clickfunnels Affiliate Program is as easy as providing value to a particular niche vertical, or customer base. Today, I’m going to answer some common questions about the Clickfunnels Affiliate Program. What is the Clickfunnels Affiliate Program? The Clickfunnels Affiliate Program is a 100 day challenge to give away 1 free trial of Clickfunnels a day. Founder, Russell Brunson claims that once you’re in the groove, this you should only take you one hour or less each day. Once a person becomes a member of Clickfunnels using your affiliate link, you get paid 40% commission off of every person you refer. There are two levels of Clickfunnels membership. A $97/month level and a $297/month level. So if a person buys the first level, you will be making about $40 a month from just that customer. Ultimately, the goal is to refer 100 people within the 100 day challenge so that you could be making $4,000 a month! If you do the math, that’s $48,000 a year. In my own experience, I actually hit $48k between 75 to 100 customers because of the supplementary commission you get from the products your customers buy. That’s a lot of money for not having to do customer support or software development. Ultimately, your only job is to promote Clickfunnels and get people to click your affiliate link before they click on someone else’s. Why Clickfunnels Affiliate Program is better than one-off sales? Let me just point out that Clickfunnels has the most favorable economics in the affiliate marketing world when it comes to reoccurring online payments, and getting that passive income we all want. According to Funnels Ignition, there are three main reasons why people are so successful with promoting Clickfunnels. Your Online Revenue has some great tips on how to make the most money using this software as well. What if I know nothing about Clickfunnels Affiliate Program? Can I really do this? Yes you can, and clearly you should! What a great opportunity to earn for your family, quit your day job, save for a house, school, or a vacation! Don’t be intimidated; don’t let fear hold you back, but as you get into the program, be patient and give yourself the freedom to learn as you go. Income From the Red Dot explains the training itself is designed for anyone, even those who know nothing about affiliate marketing or haven’t made a single dollar online. The first 5 days of videos are especially helpful and super in-depth. As I said before, this is a great way to earn a passive income, but you need to know what you’re doing. Realize that takes time, take small bites, and if you put in hard work, you will see money coming in. Honestly, if you’re going to be in it for the long haul, you need to first understand the psychology of why people use Clickfunnels. Take a non-scalable approach. Don’t try to scale Facebook ads at first, instead try to get 5 local businesses in your community to sign up for Clickfunnels and ask to build their funnels for free. Your compensation is now you have 5 affiliates. Keep doing this until you get 15 to 20 affiliates, until you have saturated your psychology and understanding of what the customer out there needs. That is when you start to scale because you’ll start to see patterns in the market place that will be so valuable to you and set you up for a successful business. Do the work, take the action. As a side note, I would suggest joining some Clickfunnels Affiliate Program Facebook groups to surround yourself with like-minded people to motivate and encourage you. This can be a great place for you to ask questions and will make it more fun too. Is the Clickfunnels Affiliate Program Free? This is a two part answer. The Clickfunnels Affiliate Program is worth $997, but access to this course is entirely free, complete with the training you need to successfully promote the program. Hypothetically, you could promote Clickfunnels without a subscription, but it is very difficult. With a Clickfunnels account, you have access to their templates. These templates will help you earn money way faster since you won’t have to spend time reinventing the wheel. We want to work smarter, not harder. What does the Clickfunnels Affiliate Program teach you to do? Essentially, you’re going to be learning the best strategies to promoting Clickfunnels to help you reach the $4,000 a month goal! Below are a few of the key concepts the program covers. You are not simply learning how to do business online. You’ll be learning how to find your niche, thrive in your market and name and claim your customers. Facebook ads are crucial in the online marketing world today. While SEO is awesome, it can sometimes take a while to rank at the top and get your message out. Facebook ads are definitely the quickest way to convert prospect into customers. The program helps you learn how to get your customers to buy from you again and again, not just close a one-time sale. You’ll learn what the “attractive character” is and how to get people to follow you and purchase your product. Essentially, how to get people to sign up for Clickfunnels using your name and affiliate link! I think a great way to acquire more customers is to build a product or service around Clickfunnels. Maybe teach a Facebook advertising course, and inside that course give away a free funnel. Customers can click on the link and you’ll be stimulating affiliate sales by simply selling your own product. 2. Free Trial, Free Trial, Free Trial! The most powerful word in the world is free. Everything you do in your messaging, always encourage people to start a free trial. Because when you push people to use the free trial, the greatness of Clickfunnels takes over and sells itself. Russell Brunson is great at converting free trials to customers. Leverage his strength to get you customers! Sharefunnels is a unique feature inside Clickfunnels where I can share a funnel I’ve already built, and it imports into your Clickfunnels account when you click on it. If you do not have a Clickfunnels account, that link acts as an affiliate link to land another customer! If you haven’t gotten into lead generation, it’s one of the more valuable niches out there. If you think you would be better at acquiring a local business as a customer, offer to build a sales funnel for them and you can simply sign them up for a Clickfunnels subscription through your account. Clickfunnels has been out for 3 to 4 years, so there are less and less SEO opportunities for you out there. Get Your FREE Copy of the Funnel Hacker’s Cookbook Today! Provide a value stack, provide a stack of bonuses, teach people, provide people the opportunity to sign up for Clickfunnels. Give people the opportunity to take action! Hope all of this is helpful! If you're not a Clickfunnels user, you may need to start a 14 day trial and give all this a test try. I am a Clickfunnels affiliate. I do get paid a commission at no extra charge to you when you sign up using one of my ClickFunnels affiliate links. To access these bonuses, simply use my links on this page to start your free trial of Clickfunnels, then, email me at josh at groovymarketing dot biz. I personally respond at that address with your bonus logins.